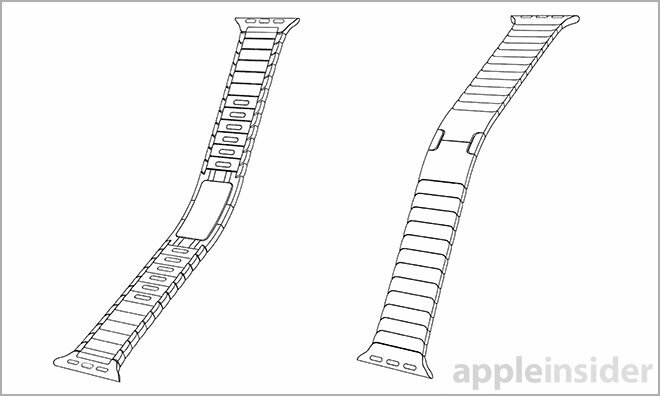 Just days before Apple Watch is slated to ship out to early buyers, Apple on Tuesday was granted patents for its unique Sport Band, Classic Buckle and Link Bracelet device accessories, protecting the innovative designs from potential copycats. Assigned to Apple by the U.S. Patent and Trademark Office, U.S. Patent Nos. D727,197, D727,198 and D727,199, all titled "Band," cover designs for three Apple Watch accessories that have since been branded Sport Band, Classic Buckle and Link Bracelet, respectively. 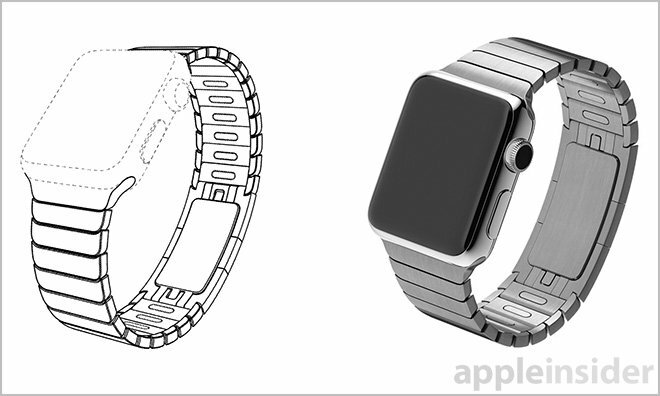 The patents come one month after the USPTO granted Apple a patent for the Apple Watch's "Modern Buckle" strap. Already well documented and available for try-on at Apple Stores worldwide, Apple's bands feature magnetic pegs that facilitate easy swapping and installation. In practice, users simply depress a pusher on Watch's casing, slide out the band and insert a new one. Apple's Link Bracelet design shows off what is arguably the most intricate Apple Watch accessory to be offered at launch. Constructed from stainless steel, the band contains more than 100 parts, including an innovative spring-loaded butterfly clasp that, when closed, sits flush with surrounding links. Unlike other link bracelets of similar design, Apple's product can be adjusted at home without tools thanks to a series of special spacer links that feature individual release buttons. Pressing the button detaches the link from its next door neighbor, granting wearers the ability to easily reconfigure bracelet length using nothing but their fingers. For the sport version, Apple's drawings clearly outline a "fold under" design in which wearers fix loop size via a pin-and-tuck fastening system. Users first adjust the band to size, seat a large pin in the nearest hole and slip excess strap under the band. The design is tailored to prevent bands from flapping about, a good feature for active users. Sport Band is made from fluoroelastomer, a dense but flexible material that feels surprisingly soft against the skin. According to Apple Store representatives, the fluoroelastomer recipe was strenuously tested to prevent rashes and other adverse skin reactions. Finally, the Classic Buckle, like Apple's Modern Buckle and Milanese Loop, features traditional lugs connecting the magnetic peg system to a simple leather strap. Terminating one end is an oval-shaped buckle and tang, while the other section sports sizing notches spaced at regular intervals. A fixed hoop stays excess material. 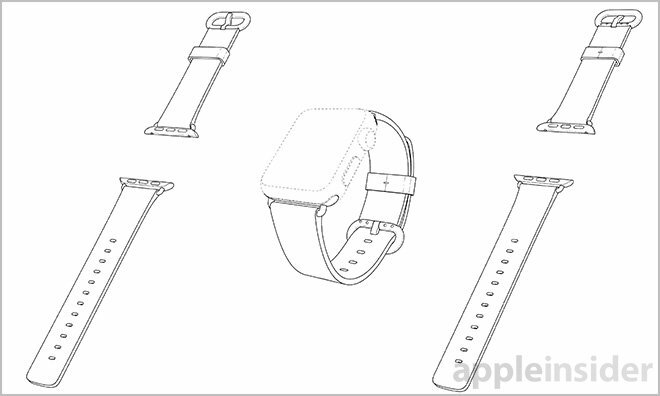 Each of Apple's three strap design patents were applied for in August of 2014 and credit a number of inventors, including SVP of Design Jony Ive, designer Marc Newson and longtime employees like Jody Akana, Duncan Robert Kerr and Christopher Stringer.